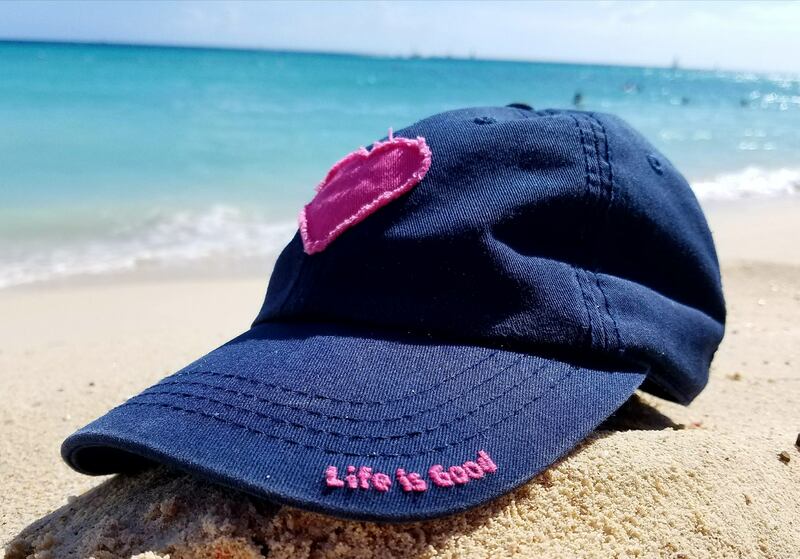 We might be fooled into thinking that their success is due to how this slogan resonates with so many of us – we see the t-shirt or the hat and excitedly think, “Yes, I like that. Life is good.” But I’m wondering if there is more to the story. Is part of their retail prowess actually due to how much we want life to be good, how much we want to only take a look at the cheery part of life, how much we long to forget that life isn’t always good? Well, I’m here to tell you that life is good . . . and . . . then it’s not. And, damn, the “and then it’s not” part feels really tough. This thought came to me recently as I was sitting by a beautiful beach donning my optimistic Life is Good® hat. After a particularly bad “and then it’s not” eighteen months, I was enjoying my sun and sand escape and thinking about how, in those moments by the shore, life truly did feel good. My life that had been turned upside down and had felt so broken and challenging, remarkably felt okay – how could that be? Well, I believe the answer to that question lies somewhere amidst the idea that a life lived to its fullest is teeming with a duality that we sometimes fail to embrace. Upon deeper reflection, I’m slowly considering the notion that “good, and then it’s not” is what makes life deeply rich and gratifying. I know, you’d think with the all the philosophers, poets, and writers who have touted this notion – life is both dark and light (case in point, Ralph Waldo Emerson’s, “When it is dark enough, you can see the stars”) – that I’d have gotten the message by now, but as with many themes we read and see over our lifetime, it sometimes takes an intimate relationship with experience to really grasp them. Life is good – then it’s not – and then it is again. And so goes a life well-lived. Perhaps I should print it on a t-shirt and see what happens. Thanks Pat! Will I see you in Santa Fe?